Ever since its opening in 1905, Dongdaemun Market has been one of the major markets in Korea. Specializing in wholesale clothing, the market has grown large, having more than 20 shopping malls. A full range of fashion items that cover head to toe, are found in Dongdaemun Market at inexpensive prices. Just name it and you shall find it! No wonder the market is always crowded with retailers, foreigners, customers and tourists. The main street divides Dongdaemun Market into two sections. Section 1 is on the side where Doosan Tower is found, and Section 2 is on the side of Dongdaemun Stadium (see the map below). Huge shopping malls in Section 1 basically sell wholesale and retail goods, but mostly deal with general customers and tourists at retail prices. Thus, they have convenient facilities like money exchanges and information desks with English speaking staff. Opening hours are also aimed at general customers, opening from 10 am to 5 am the next day. With a pleasant interior, and rhythmical music played all day long, shopping malls in Section 1 draw many young people everyday. Various events organized by these shopping malls (7 or 8 pm) are also delightful. Sometimes you will get to see youth come up on the stage in front of the mall, dancing or singing. 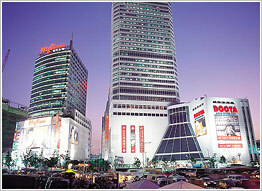 Major shopping malls are Doosan Tower, Migliore, Freya Town and Hello apM. Shopping malls in Section 2 sell goods both in wholesale and retail, but mainly sell in bulk. That is why shopping malls here usually open at about 8 pm and close at 8 am or 5 pm the next day for the convenience of wholesalers. The peak time comes late at night through early morning. Since most shops deal with wholesalers, there are no dressing rooms. Refunds and exchanges are not guaranteed, so make sure to check the quality and size carefully. Major shopping malls in Section 2 are Designer's Club, Migliore Valley, Nuzzon, Gwanghee Fashion Mall, Jeil Pyeonghwa, and Heungin Stardom. Among them, Jeil Pyeonghwa and Heungin Stardom attract customers in their thirties and forties with items of simple and elegant design. Teens and youth in their twenties usually visit Designer's Club, Migliore Valley, Nuzzon and Gwanghee Fashion Mall. Near Dongdaemun Market is Dongdaemun Stadium. There is a variety of sporting goods shops around the stadium.